This warm and inviting cottage is a wonderful getaway for anyone needing rest and relaxation but can easily entertain up to eight when booked with another cottage for four. 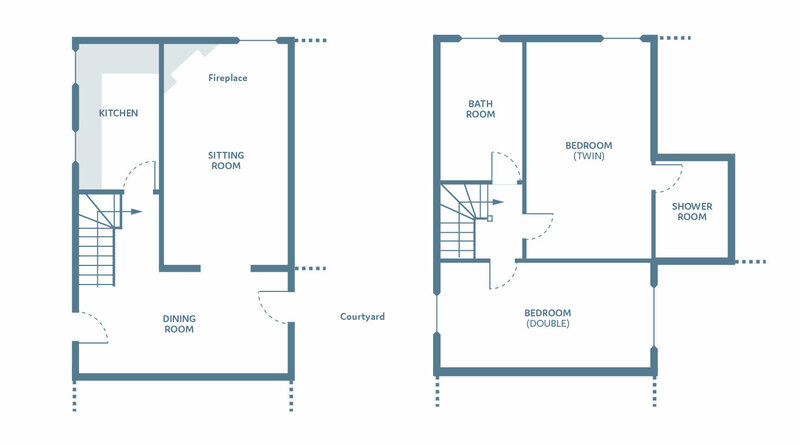 Bedrooms: One double room. Two twin rooms. Bathrooms: One en-suite shower room and one family bathroom. The warm and cosy atmosphere of this cottage is reflected throughout in the colour and decoration. This popular holiday cottage is accessorised with specially designed furniture with a rustic feel. You approach from the car park through a private garden area with table and chairs and enclosed by a box hedge up to the cottage door. You enter a spacious hall/dining room with handmade oak dining table, which can be extended to seat up to 8 guests, and views of the cobbled inner courtyard. An archway with original beams leads into the sitting room, with a gas fire, curl-up comfy sofa and armchairs and bespoke wooden furniture. Off the hall is a fully fitted kitchen. The master bedroom, with its impressive headboard, is decorated in neutral tones with striking upholstery and features an en-suite shower room. The twin bedroom features a unique Gothic window screen salvaged from a demolished wing in the Abbey and has unique headboards and furnishings in warm yellows and greens – reminiscent of the woodland at Combermere. The pretty bathroom across the hall, private to the twin bedroom is tucked under the eaves of the building and has a bath with hand shower.